Considering the well-established relationships between stellar mass, surface temp, and luminosity, how unusual would it be to find a star (or brown dwarf) that possesses about half the mass of an average member of its spectral category? Follow-up questions: If such an anomaly did exist, what sort of phenomena could be responsible? Would it be relatively stable over a human lifespan? Or would it necessarily be a transient phenomenon like most variable stars? The specific example in question is a brown dwarf with a mass ~7110 times Earth, radius ~12 times Earth's, and a spectral black-body temp of 1400K (placing it in the L8 to L9 spectral class). For a sci-fi story, I've constructed a setting with this brown dwarf, Kabina, in orbit of the star Phi2 Ceti (renamed Bahram in everyday parlance), and multiple colonized planets orbiting both the primary star and the brown dwarf. On reviewing my notes recently and double-checking the numbers, I realized that late L-class brown dwarfs tend to have a mass 1.5 to 3 times the figure I was working with. 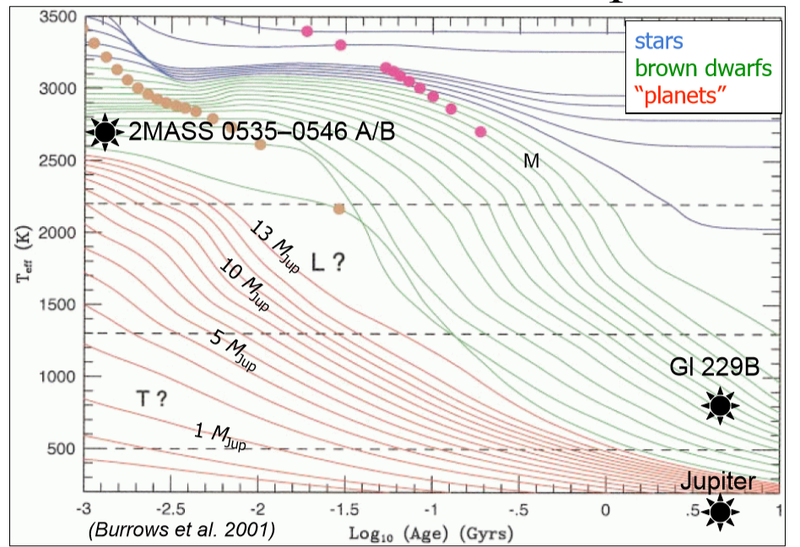 Whereas brown dwarfs of similar mass are liable to be less than half as hot and bright. I've calculated the orbits and surface temps of the orbiting planets based on these numbers, so if I need to fix the properties of my brown dwarf, I need to also rework the planetary orbits in order to maintain habitability. If, on the other hand, I can find a plausible explanation for the anomaly, it becomes a cool little detail of the system to add scientific curiosity, and I don't have to rewrite the calendars I've already drawn up for the colonies in orbit. $\sim$7000 Earth masses and a surface temperature of 1700 K aren't unreasonable for a brown dwarf. The lower mass limit is thought to be around 13 Jupiter masses (or 4100 Earth masses) (see e.g. Spiegel et al. 2010), and we see temperatures as low as 500 K in certain Y-class brown dwarfs. 12 Earth radii seems a bit small, but not unrealistic. To be honest, you chose decent parameters. This is certainly much too light for a red dwarf, of course; the hydrogen fusing limit is about 75-80 Jupiter masses, which is, give or take, three times as high as your choice. However, I would argue that you've chosen a fairly realistic brown dwarf. A brown dwarf should reach the temperature you desire within about a few hundreds of millions of years. The latter two are actually pretty similar to yours, in terms of mass and temperature. If there was a brown dwarf of, say, 10 Jupiter masses, well, it might instead be classified as a rogue planet or sub-brown dwarf, rather than a brown dwarf. Cha 110913-773444 is an object like this (Luhman et al, 2005). We don't know how these bodies form; it's possible that the low mass is simply due to a dearth of material around the body early in its life. Not the answer you're looking for? Browse other questions tagged science-based space hard-science astronomy stars or ask your own question. About how many planets are plausible for this binary-star system? Can life arise on a brown dwarf? How can I make a black dwarf star? Would this simplex ternary system be stable? What are some plausible formation explanations of a non-hot “Fluffy” Gas Giant planet?